Yowza! That’s some decadent dinner. But I’m all about trying to figure out how to recreate my favorite, really bad for you foods sans gluten. It was only a matter of time before I busted out a macaroni and cheese recipe that makes it worth skipping the boxed varieties. And even Oprah* agrees, this mac and cheese recipe is the absolute best. And you know what goes so well with mac and cheese? Chicken fingers. 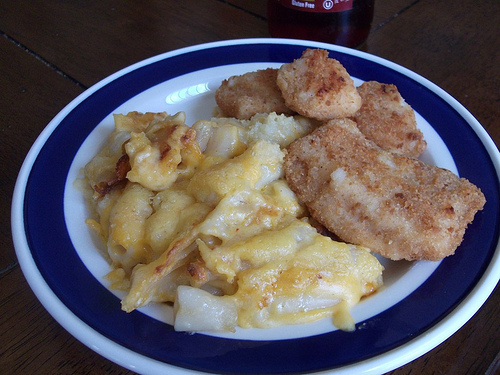 So gird your arteries, celiacs, you’re going to want to make this three-cheese dish worthy of the Queen of Talk and serve it up with a side of gluten-free chicken fingers. Duh. When you’re cooking gluten-free pasta, it generally turns out al dente, but you want to make sure it does in this case because otherwise your end result will be squishy mac and cheese. I prefer the brown rice penne from Trader Joe’s for this recipe, and I always rinse with cold water after cooking. It looks like this. Set aside your pasta and heat oven to 350. 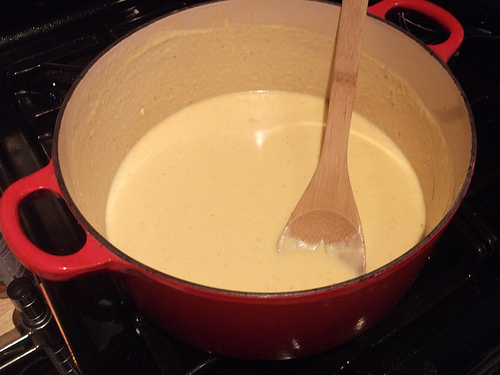 Butter or spray a four-quart casserole. 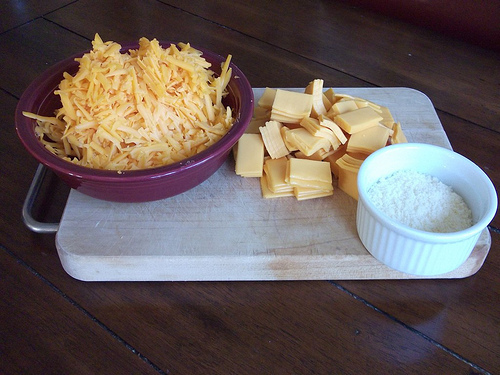 Remove roux from the heat and stir in one cup of the cheddar, and one cup of the American cheese. Season to taste with salt, pepper, and hot sauce. Combine the remaining cheddar and American cheeses. 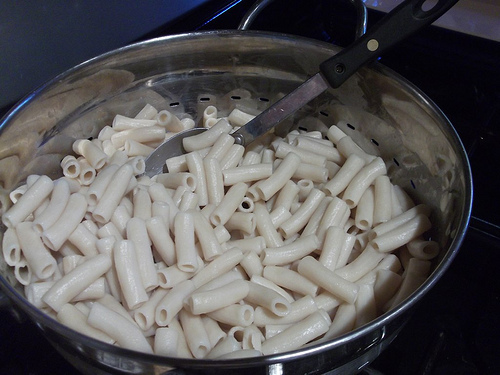 Spread one-third of the penne over the bottom of the casserole dish. 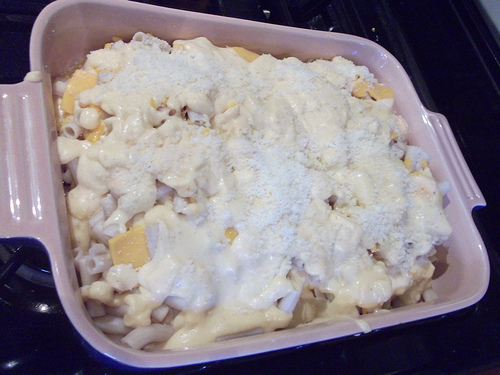 Top with half of the shredded cheese and a third of the sauce. Repeat, using another third of the penne with the remaining cheese and half of the sauce. Finish with the remaining penne and sauce. Sprinkle Parmesan cheese over the top. Isn’t it beautiful? Bake for about 30 minutes, until bubbly and golden brown around the edges. While you can make your own chicken breast nuggets (just cut breasts into small pieces, roll in corn starch instead of flour, fry) I’ve recently discovered these gluten-free chicken breast fingers (antibiotic free, natch) from Bell & Evans, thanks to my friend Rebecca over at Cooking With My Kid. So, yeah, after all that work on Oprah’s favorite mac and cheese, give yourself a break and cook these up in the oven. I admit I’m falling in love with Bell and Evans. It could get complicated. Indulge. Just like Oprah would. *Umm, you know, if the Internets are to be believed, this is Oprah’s fave way to dig into the mac and cheese, one panful at a time. Or at least it was five years ago when I first discovered it. Now everyone is claiming the title. Stupid Internets. Tags: gluten free eating, gluten free flour, gluten free pasta, gluten free recipe, mac and cheese. Bookmark the permalink.